- access digital books, movies, music and more! Bring your laptop. Everyone welcome. Register by Thursday, April 18, by calling Joan. 613-470-0060. Rural Root Theatre’s Spring Production is “Bedtime Stories” by Norm Foster. It is a zany comedy that brings together six funny and touching tales presented as loosely related vignettes, featuring Foster’s signature comedic debacles laced with mild sexual innuendo. A cavalcade of characters with their stories linked by a late-night radio contest, a rock and roll concert, a taxi and, of course, a bed. Each vignette stands alone as a comedic take on the lives, loves and challenges faced by fifteen ordinary people and at the same time weaves a connection about friendship, romance and the true meaning of love that links the people and stories in unexpected ways. The play runs from Tuesday, April 23 to Saturday, April 27 at 7:30 pm and a matinee on Sunday, April 28, at 2:00pm at the Northwind Wireless Fibe Centre. Go to www.ruralroot.org for more information and to book tickets. 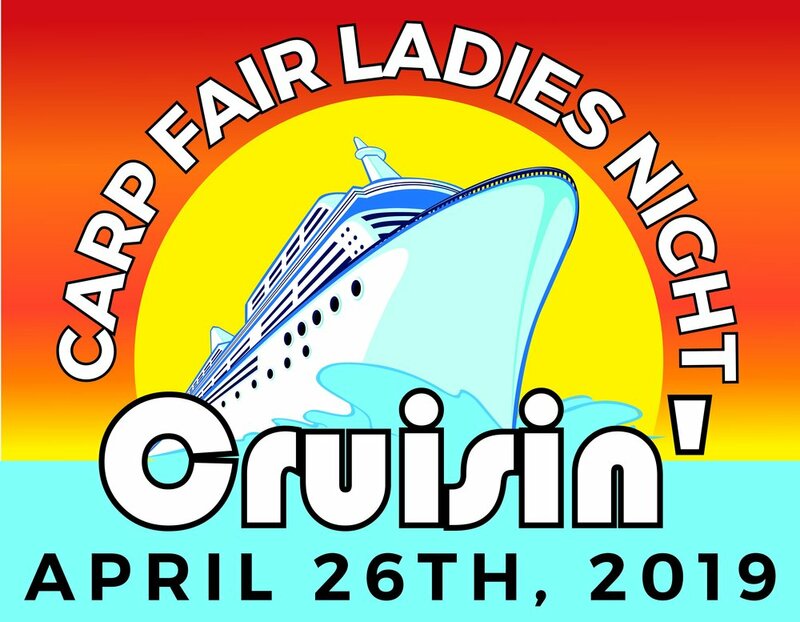 SAVE THE DATE: Carp Ladies Night for 2019 is happening on Friday, April 26. More details and tickets coming soon. Visit www.carpfair.ca in the future for more details and ticketing information. Residents are invited to a public consultation to review and identify current accessibility barriers in programs, services and facilities in the City of Ottawa as part of the creation of the City's new Ottawa Municipal Accessibility Plan. A consultation session in West Carleton-March is taking place on Monday, April 29, 7-8:30 pm, at the West Carleton Community Complex (5670 Carp Rd.) CLICK HERE to register to attend this session. There is also an online survey residents can complete to provide their input on the City's accessibility plan. The 23rd Annual Diefenbooker Race is Saturday, May 4. Walk, run or bike with the community. The website is now open for early bird registrations . Register before March 23 for discounts. The proceeds support literacy. Bring your family and friends. There is something for everyone. Go to diefenbookerclassic.ncf.ca. The next edition of the Carp Fair is happening September 26-29, 2019. Full event details will be posted on www.carpfair.ca closer to the date. Corkery Community Association is holding an Easter Egg Hunt on Monday, April 22, 2019, 10am to 11am, at the Corkery Community Centre. Children of all ages and their guardians. It is free to attend, but you should RSVP via their Facebook pages, so organizers can get an idea of the number of attendees. To RSVP CLICK HERE. The West Carleton Legion in Constance Bay is holding their Annual Children’s Easter Party. Starting at 12:30pm. Bring your kids down to the Branch for some Easter Sunday fun before dinner! There will be snacks, crafts, and cupcake decorating! The Easter Bunny will drop in with treats! Everyone Welcome! This year’s annual Easter egg hunt is on Saturday, April 20, and starts at 1pm sharp; loads of chocolate and great prizes. The event moves inside if the weather or snow doesn’t cooperate. Bring a donation for the West Carleton Food Bank for a chance to win a door prize. BYOB - Bring your own basket! The secret is out… the Easter Bunny will be making a stop at the Diefenbunker Museum over Easter weekend! You’re invited to explore the Bunker with a unique twist on your typical Easter Egg Hunt. In preparation for Easter weekend at the Diefenbunker, the Easter Bunny (AKA Peter Cottontail) came for a visit underground. After taking a tour through 100,000 square foot Bunker turned museum, Mr. Cottontail decided to create a clever family-friendly scavenger hunt using camouflaged eggs. There will be three levels of difficultly to accommodate a variety of ages and abilities to guarantee that everyone in the family will have a blast! Can you figure out where the Easter Bunny has hidden all of the eggs inside the bunker? Here’s what you need to know: Please note – Tickets must be purchased in advance! You must select a specified entry time to the Museum when purchasing tickets. If you miss your entry time, we will do our best to get you inside the Museum, however if we are at capacity there may be a waiting period. We highly recommend purchasing tickets for this special event in advance online or by phone (613-839-0007). TO BOOK NOW, CLICK HERE. Upon arrival, you’ll be given a scavenger hunt checklist and pencil to tally up where all the eggs are hidden. At the end of your scavenger hunt, you will receive a treat bag that is nut-free. Eggs are affixed to walls and other hiding spots and not removable, so there is no need to bring an Easter basket. No chocolate eggs will be hidden throughout the museum. No Public Tours will be offered this weekend. Consider bringing a baby carrier, instead of a stroller. The Museum is tough to navigate between floors (you’d have to carry the stroller up and down stairs). SAVE THE DATE: The 2019 edition of Carp Men’s Night is set for Thursday, April 18 at the Carp Fairgrounds. Event details and tickets coming soon. Visit www.carpfair.ca in the future for more information. For more information visit: www.westcarletonartssociety.ca. The Fitzroy Harbour Community Association is hosting their AGM on March 28 at 7pm at the Community Centre. Please attend and support your community volunteers. The Huntley Township Historical Society presents "A Celtic Music Concert featuring local band, The Barley Shakers” on Tuesday, March 19, 2019. 7:30-9:00pm at the Memorial Hall in Carp. Enjoy Irish, Scottish and Valley favourites! Free will donations appreciated. Light refreshments. Everyone welcome. Information: Suzanne 613-839-5203. We’re holding our Annual General Meeting (AGM) on Wednesday, 3 April at 7 pm at the Carp Memorial Hall, 3739 Carp Road. It will be followed at approximately 7:45 pm by our sixth public briefing where we’ll talk about our activities and plans for 2019+. We welcome the community to the AGM, but only members in good standing can vote on the budget and the slate of directors. As part of our public briefing we welcome guest speaker Holly Bickerton, Consulting Ecologist. Holly recently completed an ecological survey of Ducks Unlimited Canada’s Carp Hills property. Holly will talk about what she found on the DUC property and about the bog beside the Crazy Horse Trail. Join us to find out what’s happening, provide feedback, and find out how you can help. As a community organization we rely on your support and involvement. Irish Stew Dinner, Thursday, March 14, 4:30 to 7pm at St. George's Anglican Church, Fitzroy Harbour. Cost is adults $12 and children under ten $6. Take out and gluten free available. More info: 613-623-3882. Deep Roots Food Hub AGM will be held on March 6th, 6:30-8:30 p.m 2019 at the West Carleton Amateur Sports Club, 3832 Carp Rd., Carp, ON Refreshments and snacks will be provided. More info at: www.deeprootsfoodhub.ca. Six-Hand euchre at the Galetta Community Hall, 119 Darwin St. Start time 7pm on Thursday nights in February (February 7, 14, 21 and 28.) Admission $5. Prizes and refreshments. On Tuesday, February. 19, 7:30 -9:00pm at Memorial Hall, Carp. The Huntley Township Historical Society: "Red Cross WWII Gift Boxes to Huntley Soldiers" presented by Helen Weeden. Free will donations appreciated. Light refreshments served. Everyone welcome to attend. Information: Suzanne 613-839-5203. A winter carnival will take place in Dunrobin on February 10, from 1pm to 4pm. Please see the Dunrobin Community Centre Facebook page (https://www.facebook.com/events/373803469864630/). They’re planning activities like family shinny, skating races, building ice castles, etc. Stay tuned for more details and visit their Facebook page closer to the date! The Diefenbunker invites families to join them in making handmade Valentines for the brave men and women who served our country. The Diefenbunker has partnered with The Perley and Rideau Veterans’ Health Centre to create these tokens of affection for its residents. Attend the Diefenbunker on these upcoming Saturdays and Sundays from 10am to 4:30pm: January 26, January 27, February 2, February 3, February 9 and February 10. Included in the cost of admission. For more details go to www.diefenbunker.ca.